Treat yourself to the sound frequencies of the gong. The gong conducts sounds and frequencies that help clear and quiet the mind. It’s a space where one will drop into the silence and into the remembering the truth of who we are. This is a perfect way to end the day. The gong will carry you into a deep restful sleep to start your day with a new perspective. Kirtan is a form of yoga. In this yogic practice we sing. Mantra’s are a repetitive process that is easy and fun. This will also help your voice open up which creates one to speak their truth and connect to the heart. Join me at Prana Yoga Center for a deep practice with Lisa and live music during your Shavasana. Harmony will be playing her 32” Symphonic Gong along with other instruments to take you on a healing sound journey. Please join Flowering Heart, Harmony Halberg and Kristin Panek for this powerful, exciting and love filled day as we offer flowers and our prayers to call in the beloved energy. This could be from calling in your partnership with a man/ woman or deepening your relationship with your husband/ wife or diving into a deeper love with YOUR Divine Spirit. We will be chanting a powerful mantra 108 times to call in your beloved. After every round of chanting we will be offering a shower of flowers. This puja will be delightful, filled with love and abundance. You will leave this event feeling full of love and ready to call in your beloved energy. Please join Brandon Bott, resident musician at Flowering Heart Center, and special guest for a extraordinary concert. Flamenco Music, Dance, high energy music and entertainment. Please join Flowering Heart and a guest DJ Roman to explore ecstatic dance, body movement, sweat and falling into bliss through a high vibrational state. Conscious dance is a form of meditation. We create a safe container through some simple guidelines. Flowering Heart will be guiding you thought this dance movement meditation. Her unique flow allows for your transformation and leaves you feeling ecstatic and joyful. Enjoy this night of bliss as the lights are dim, essences of the palo santos, flower essences and essences that will ignite your inner joy..
$10 with valid student I.D. Sound Medicine is a unique meditative process done through sound. We use different elements to create sound such as crystal bowls, Tibetan bowls, bells, Harmonium, percussion, song, Mantra and more magical vibrations. In this meditation, you are welcome to lay back, get comfortable and enjoy this time for deep relaxation, decompressing your stress, worry or angst. It is a your time for deep self care. Different guest artists will be offering their unique gifts so please check out the dates and personal bios to see if you resonate with the offerings of the week. Sound Medicine will be every 2 & 4th Wednesday of the the Month from 7:30-9:00 P.M. Hot Apple Cider will be served at the end of this meditation to prepare you for your drive home. It is a great way to experience the nectars of Mother Earth. Please join Harmony and a guest DJ to explore ecstatic dance, body movement, sweat and falling into bliss through a high vibrational state. Harmony will be guiding you thought this dance movement meditation. Her unique flow allows for your transformation and leaves you feeling ecstatic and joyful. She brings in a powerful and loving energy from her 9 years of living abroad in Bali, Indonesia. This energy is from Mama Bali, which is the energy of the heart chakra. Love, connectivity, freedom, empowerment and community. Enjoy this night of bliss as the lights are dim, essences of the palo santos, flower essences and essences of Harmony’s worldly travels. Kirtan/ Bhakti Yoga is the highest limb of the yogic practices. It is considered to be the fast track to liberation and Oneness with your Divine Spirit, whatever this may be for you. In Kirtan, we will be sining Mantra’s. To me, Mantra’s are energetic systems that create a energetic grid to enter into the transcendental state. This is where you can connect to your Divine Spirit and speak your prayers. Kirtan can be a ecstatic experience where you body may want to move, you may feel the urge to clap or simply be still. All forms are perfect as this space Harmony contains is a space of ultimate freedom to be in your unique experience. Harmony sings in Sanskrit, the oldest language known to creation and she also sings in English. She creates a space that is non-denominational which allows all people to experience through their own form of connection. She also teaches you the Mantra’s so it is easier for you to sing along. “We create this band together” says Harmony. We all become alchemist of sound and vibrations and when doing so, the energies become powerful, uplifting, transformational and creates a deeper connection/ bond with your spirit. Brandon Bott is a masterful youthful spirit that adds the elements of percussion that moves you into your own heartbeat rhythm. He has been studying and playing music from a very young age so his masterful charm moves your spirit into ecstasy. We welcome all walks of faith, religion and spiritual paths. Children are welcome as well. We do encourage the children to take part of this gathering in song and prayer as we form this meditative circle together. We conclude every Kirtan with a hot pot of Kitchery, a Ayurvedic porridge that is vegan and is considered one of the healthiest foods to consume. It is a great way to connect and create new relationships and leave feeling elevated. Let’s keep this energy building as we connect deeply in community. All are welcome for this event, including children. Please spread the word with your friends and family. The more people gathered, the more energy will be conducted. Let’s create this together. Kitchery will be served following the event. This unique evening will be a focused on Sound Medicine. I will be creating a unique experience for you to gently experience how sound medicine provides a deep healing experience for you. There will be hands on energy work done along side beautiful music that will sooth your heart and soul. I will be also using essential oils to help in this deeply relaxing healing energy. Please bring with you a mat to lay down on, blanket and whatever you will need to be comfortable and warm. Let’s celebrate this moment together as we sing, pray, chant, laugh and elevate our energies together at the Flowering Heart Center. This will be a regular event on Wednesdays now. The 1st and 3rd Wednesday will be Kirtan and the 2nd and 4th week will be Sound Medicine. For this event, I call it Kirtan and Kitchery as there will be Kitchery served at the end to the session. Born in Sasebo, Nagasaki, Japan, Brandon started playing the drums at age 11. Soon after his family moved to Guangzhou, China, he eventually shifted his classical percussion focus to that of jazz, and immediately started gigging around the country. He is now a student at the Northern Illinois University finishing up his degree in specialized world percussion performance, studying Cuban, Brazilian, Middle Eastern, Indian, Thai percussion, as well as drumset and jazz. 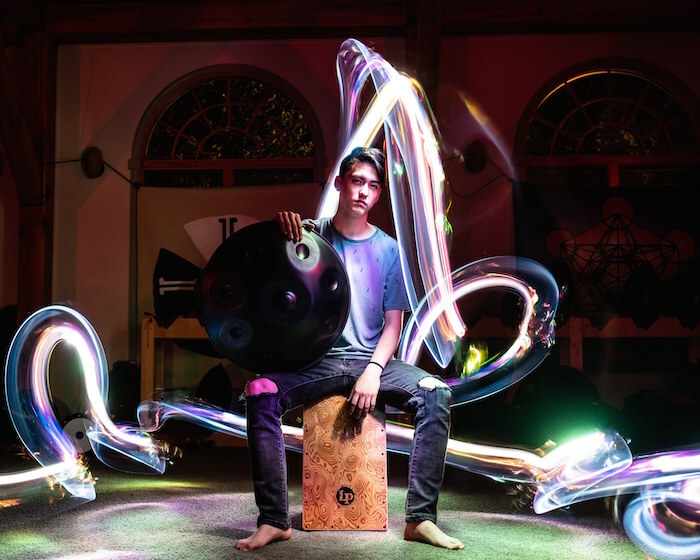 He has also recently added handpan to his repertoire and is writing new compositions to add to the mix. He is currently active in performing in the Chicago area, and has recently appeared in Japan, Taiwan, the United States, and across China. Please invite your friends and family as you all help create the vibes. This will be a powerful weekend lead by Spiritual Guides from India. They will be focusing the energy on transformation and so much more. I will be sharing Mantra’s throughout the course and would love to connect with you all. Please be sure to come and say hello. By referring your friends, you will benefit greatly. This is a great way to reduce the price and pamper yourself. Each person that is referred to me through you will be added toward your credit. No maximum number. Share and Save $$$. Be sure your trusted friends, mention your name. Call 630-780-0053 to book today! Feeling a deep essence of excitement to be coming to the new Flowering Heart Center in Wheaton, IL. I will be sharing a night of Kirtan, sharing a one-day workshop with Kristin, offering spiritual guidance sessions and Sacred Healing Haircuts. More specific information is to come. Feeling ready and excited to have my feet back on U.S. soil I will be basing myself from Los Angeles and feeling if this land will hold and support the energies. Feeling Blessed. Time to take care of my body, mind & spirit. Harmony and her music mentor Sudhanshu Sharma will join hands to hold this powerful sonic sound 7 day music retreat in Bali, Indonesia. We will be focusing our energies on the Indian saragam SA RE GA MA PA DHA NI SA and teaching beginners Sanskrit. We will understand on the deepest levels where the sound comes from and how to access into the sound and energy portals. We will celebrate entering into the new year with a Kirtan, traditional Indian Saraswati Puja and much much more. We have just made some changes which have affected the prices.. they have reduced.. Exciting news! Please join Harmony and Friends for a sacred evening of singing and chanting Mantra and song.